After delaying its issuance in order to bask in the continued normalization and celebration of his regime by mainstream media, Trump last Monday signed his regime's latest attempt at introducing a "constitutional" Muslim ban. And today, this order is scheduled to go into effect. Do not let new words disguise old intentions. Photo: Sarah-Ji of Love & Struggle Photos, during the first Muslim Ban protest at O'Hare International Airport. Sure, a federal judge in Hawaii has already blocked this ban from being implemented, but the fight for Muslims is far from over. 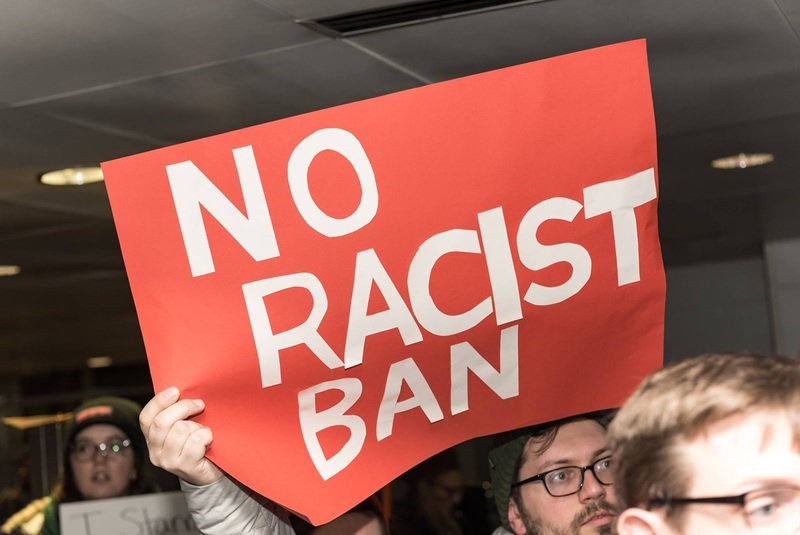 Despite this ruling, it is still important to continue to understand and dissect the ways in which the state works to harm Muslims, and important key words common in anti-Muslim policies as well as contexts in which this revised Muslim ban is situated. 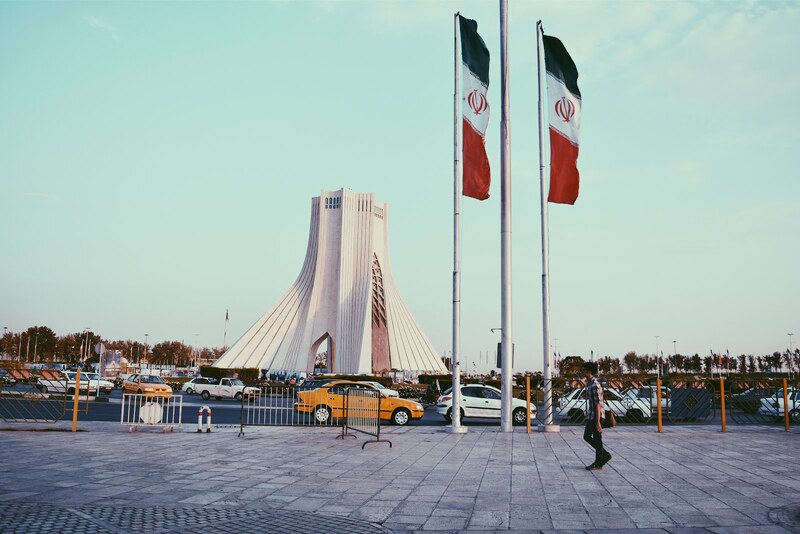 The new order "temporarily" bans nationals from Iran (my motherland), Syria, Yemen, Somalia, Sudan and Libya -- all Muslim-majority countries that are suffering through US bombings, drone strikes or ruinous sanctions -- from receiving visas to enter the United States. The new order also expands its suspension of refugee resettlement to include a 120 day-suspension for all refugees seeking safety. It also differs from the last executive order in its removal of the exception made for "religious minorities" fleeing persecution (i.e., the exception for Christian refugees, as we always knew a Shia Muslim fleeing persecution in a Sunni-dominated state would not be classified as such). And finally, the new order claims not to apply to those foreign nationals who have already been granted asylum or visas. Also notably different from the last executive order is that Iraq has been removed from the banned countries -- but not because the Trump regime suddenly has realized the United States' role in destabilizing and destroying the nation. Rather, Trump crossed Iraq off from the list based on an idea that most US politicians share: the notion that the sole value of Muslims is as a group on the "inside" that can fight terrorism and protect Americans. Just as Bill Clinton's speech at the Democratic National Convention requested that "If you're a Muslim and you love America and freedom and you hate terror, stay here and help us win and make a future together," the Trump regime sees Iraq as a strategic ally to help fight "terrorism" -- and not much else. What hasn't changed from the first Muslim ban is the fact that it is, in fact, still a Muslim ban. 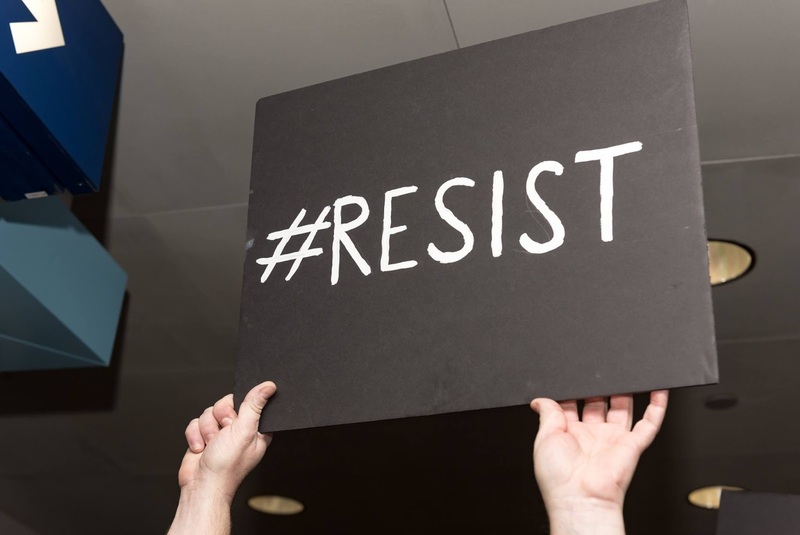 It is still xenophobic, it is still laced with anti-Muslim racism, it is still dividing families and destroying lives, and it still requires collective resistance. Furthermore, it is important to recognize that this has nothing to do with "national security." If the perceived threat of "radical Islamic violence" from Muslim immigrants is so imminent, so threatening to this country's safety, why did the Trump regime decide to delay the signing of this executive order to instead bask in the good (read: problematic and normalizing) press that followed his address to the joint session of Congress? Rather, if national security is actually the problem -- if the US government actually cares about ending the killing of American citizens -- why does it not start with dismantling its own police forces? These forces comprise an armed, emboldened and deadly organization that receives training from a foreign apartheid state (Israel), and kills almost 1,000 people annually (including already over 200 people this year). United States law enforcement officers are a larger threat to the safety and security of individuals living in this country (particularly Black and Indigenous people) than "radical Islam" -- whatever that means -- ever will be. In fact, it is important to recognize that "national security" is only a code word for anti-Muslim policies domestically, as well as the justification for US military violence against Muslim communities internationally, which is often erased from public view. And finally, know that the enforcement and reach of the Muslim ban -- however revised -- will be far beyond what is explicitly stated on paper. It's clear from the experiences shared with us by Muslims stuck at the border that Customs and Border Patrol officers now feel emboldened in their work, as Trump effectively continues to give them a green light. Still to this day, despite the first ban being struck down, Muslims and Muslim-perceived people from beyond the initial seven Muslim-majority countries have been, and continue to be, detained, interrogated, harassed, intimidated and deported. Yet, given the new ramifications and continued harm of the revised Muslim ban, the most disheartening aspect of last Monday was not the order itself. It was the loud, piercing, haunting silence of the rest of the country: the silence of acceptance, the silence of burnout and the silence of moving on. If we are this easily pacified, this quickly burnt out, this readily persuaded, then I am certainly anxious about what is to come. We must be vigilant about not allowing ourselves to accept new norms of violence and harm. 1. This is not the time to play the model minority contest | Technically, it never is time to play that game. But if your homeland has not yet been "officially" banned, do not wait until it is to come out and join the movement. And remember: whether or not this iteration of the Muslim ban names you directly, we are seeing increased detainment, interrogation and harassment of all Muslim and Muslim-perceived people (yes, more than you already faced at the airport) since the first executive order. If you're Muslim, you're sort of already on the list. So come out. 2. Skill-share | We need this movement to be long-term. Experienced movement organizers should be training young people with more energy and capacity to learn about what is happening, take up leadership, and organize. 3. Make your work accessible | We already know many of those affected by state-based violence -- especially when it comes to immigration -- have limited English literacy. Give "know your rights" trainings in different languages, translate your materials (and the text of the Muslim ban itself) into your mother tongue, connect pro bono lawyers and other resources to the community. Mass distribute in mosques, community centers, WhatsApp group messages -- identify the spaces your people occupy and take the information to them. 4. Do not make compromises | Do not compromise your values for the sake of having an extra white person join your protest. 5. Find gaps in organizing and seek to fill them, rather than compete | While everyone is running to be the first to file a federal lawsuit, work to identify and meet current and anticipated immediate needs. Does your community need political education? Do immigrants and refugees who did make it through Customs and Border Patrol need support in resettlement? Do lawyers at the airport need translators? 6. As always, be intersectional | Half of the officially banned countries are Black-majority countries. Black, Muslim immigrants and refugees are oftentimes left out from both Black and Muslim spaces, so be intentional about centering those who are on the margins of the margins. Beyond making sure not to exclude your own people, keep in mind that Customs and Border Patrol, US Immigration and Customs Enforcement, the Department of Homeland Security, municipal law enforcement and other violent institutions that target people of color are just different enforcement mechanisms with the same goal: upholding white supremacy. You cannot succeed by ignoring those relationships. 1. Show up | Support the ongoing efforts of Muslim-led organizing in resisting the ban. If you're an immigration lawyer, volunteer. If you're a teacher, connect your Muslim students to resources, and talk to your class about what is happening. If you're a journalist, document the movement. Share the work of Muslim artists, writers, creators, organizers and scholars. Hold your racist friends and family accountable. 3. Be careful not to perpetuate anti-Muslim undertones in your conversations | When talking about the Muslim ban, do not challenge it by saying there have been "no fatal attacks by immigrants from countries listed in the Muslim ban." While that is true, this not only provides a justification for banning immigration from countries that have had someone commit violence, but also legitimizes collective punishment. Also, we are not all immigrants -- that concept erases the histories of Indigenous people native to this land and Black people who were forcibly enslaved and brought here. Moreover, a Muslim refugee from a country the United States destabilized is not the same as an immigrant from the UK who is here getting a PhD. Another thing: Stop draping American flags over our hijabs. 4. Donate | Support the work of your local Muslim-led organizations supporting their people on the ground and in the courtroom. We are continuously receiving reports of families being ripped apart and lives being completely devastated because of this ban on Muslims. Do not let this become the new normal.